Home » Blog » General » Is two too late? 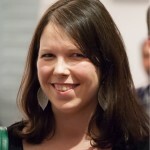 Sarah Jones was an Associate at LKMco from 2014-15. She has now returned to her first love: teaching, and is now Vice Principle of BSix College in Hackney. Having an eight-month old baby snoozing on your lap while you read education news gives you a whole new perspective. 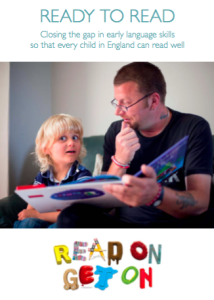 “Ready to Read”, a brilliant new report from the “Read on, Get on” coalition has managed to make me feel both reassured and anxious. According to the report, I’m right to force her to read bed time stories even though she would clearly rather have another ten minutes in the bath, and it’s apparently worth the half-hour walk up a steep hill to get to a library with a rhyme time (our local one has closed – another victim of the cuts). However my recent experiences with the Health Visiting Services makes me wonder whether they have the funding, infrastructure and skills required to take the important steps recommended in this report. “Ready to Read” highlights the important role parents play in developing early language skills, and explains how simply talking to your child, singing nursery rhymes and reading bed time stories can all help them become confident readers as they grow older. However this reassuring practical advice is set within a worrying national context, where almost 148,000 children leave primary school in England still unable to read well, and where children growing up in poverty face the greatest risk of falling behind from an early age. 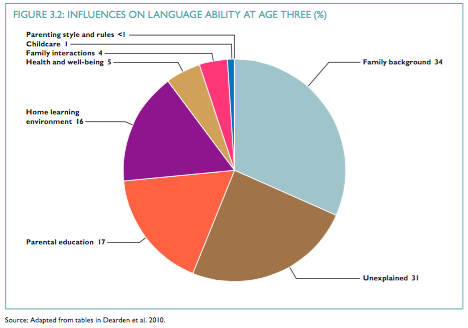 This graph, from Dearden et al (2010) features in the report, and shows that parental behaviour accounts for around a fifth of the variation in language ability at age three, and highlights the importance of helping parents in the first few months and years of their baby’s life. The report talks about the vital role played by Health Visitors, who “take over responsibility for a child’s care from a midwife two weeks after birth and until they are five years old”, and are “the main source of support and engagement with public services that families with very young children have”. The report does acknowledge there are currently limits to Health Visitors’ ability to improve outcomes, mentioning a 2011 study by Gross that found the vast majority of Health Visitors in Stoke on Trent had not received any training on language development. My first visit from a Health Visitor was when my baby was two weeks old. It started with her commenting that it was nice that my partner was there, and that he was able to hold the baby, and it finished with her deciding that I didn’t need her to visit me any more. I haven’t seen a Health Visitor since. Speaking to other mums around me suggests that my experience is far from unique. Many have had much more contact with health visitors, but few have any experience of being talked to about language. Most mentioned that the first time it was discussed was the 2 year check up – which according to the report, is almost too late. Encouragingly, one Health Visitor told me about how she used ICAN resources (recommended in the report) and a few mums had a lot of love for individual Health Visitors who had been brilliant for them and their little ones. The picture painted by the mums of South London is of huge variance in the quality and extent of provision from health visitors. The report has three recommendations for Government, all of which I thoroughly endorse: that they invest further in the nursery education workforce, strengthen support for parents, and tackle young children’s progress across the country. If their data is right, and three is too late to begin addressing language problems, there is an argument that the second aim should take priority and parents should be at the heart of plans in this area. There has been a lot of rhetoric about supporting the early years from the new Government, and in the Labour leadership contendors‘ speeches. This report is a timely reminder that rhetoric is not enough, and that decisive action (and cash) is required for real change.